Deck out your infrared grill with the right grill accessories! A grill tools package usually includes a spatula, tongs, and fork. In our opinion, the best set of grill tools on the market right now is the Weber Stainless-Steel 3-Piece Barbeque Tool Set , which sells for about $30. Not only are these designed well, but the hefty stainless steel construction makes these durable enough to last a long time. While an infrared grill is reletively easy to clean via burn-off, it is a good idea to have a good grill brush for cleaning between waves of food or to make sure tough residue gets cleaned off. 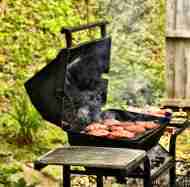 In some cases, it may make sense to just give the grill a quick brush rather than wasting 10 minutes of fuel. If you are looking for a great grill brush, look no further than the Grill Daddy Pro Grill Brush This brush is different, in that it is filled with water to help "steam clean" your grill grates. It makes an incredible difference, it really works! Disclaimer: We may receive compensation for advertising or reviews published on this site.